Seconds before an Amtrak train flew off the tracks in Washington, the engineer told the crew they were traveling too fast, according to an early National Transportation Safety Board review of the crash that killed three people. 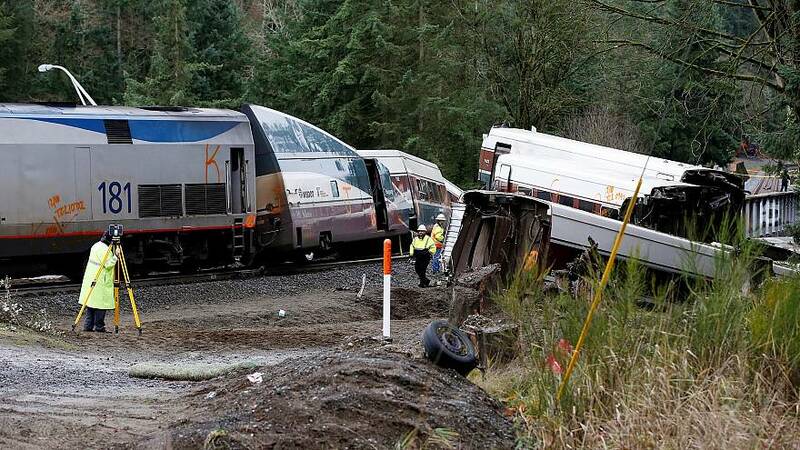 More than 70 people were injured in the Monday morning derailment, in which several train cars fell from a bridge and onto a highway in the city of DuPont, about 20 miles south of Tacoma, authorities said. The train was making the inaugural run of a new route aimed at cutting travel times and improving safety south of Tacoma. The results of the preliminary review, released on Friday, come from details gathered from an "event data recorder" and cameras mounted on the lead locomotive. The devices captured the crew's actions, their conversations and other information, the NTSB said. The recordings included comments by the engineer about six seconds before the derailment about "an over speed condition," the NTSB said in a statement. Officials said earlier this week that the engineer was in a cab with a conductor and that the train's brakes were engaged automatically, not by the engineer. The recording ended with the locomotive tilting and the crew bracing for impact, the statement said. The final recorded speed of the locomotive was 78 mph, which is within the limits for the approach to the crash location, but not the location itself, which followed a curve with a posted 30 mph speed limit, according to the NTSB. There's a sign noting the speed limit about two miles before the curve, the NTSB said. The train was not equipped with positive train control, which can prevent derailments caused by excessive speed, officials have said. The footage collected by the NTSB showed none of the crew using any personal electronic devices such as cellphones, the agency said. The NTSB's full investigation of the crash is expected to take up to two years.